For the first time knitted children's sock was found during excavations of ancient Egyptian tombs, whose age is about five thousand years. Currently, the technology of knitting the sock has not changed. For knitting children's clothes, use the softest yarn. Choosing thread, based on delicate feeling of his hands. Please measure the feet of the child the ankle and multiply that number by 3. Let's say the volume is 12 cm, then you need to dial 36 loops. On hosiery needles dial 36 loops. Evenly distribute loop on 4 needles (9 stitches on each needle). The fifth spoke – working. Knit for the shaft clockwise circular rows of 4.5 cm elastic band. The elastic band can be knit so: facial loop, loop reverse, loop front loop reverse. In each circular row of front loops knit the front and purl purl. Then to put the heel loop of the second and third spokes. Continue knitting your sweater on the loops of the first and fourth spokes. To do this, knit 14 rows front surface, wherein each second row provarite on both sides by two loops together. The front surface – all loop knit facial. Now from each side of the heel dial eight loops. After that, knit all the loops on the circular ranks of the front surface, wherein each second circular row provarite on both sides of the heel three times on two loops together. In the end, should have 32 loops. When the length of the foot 9 cm (measure from the middle of the heel) perform subtraction for the toe as follows: continuously provarite of two loops along the front. The decrease of the loops to do until, while on each spoke will not stay on one loop. In the darning needle pass the tip of the filament. Thread the needle open loop make a knot. Tighten the thread tight. Tuck the remaining tail inside the sock. The size of the shaft of the foot tie regarding the size of the child's foot. 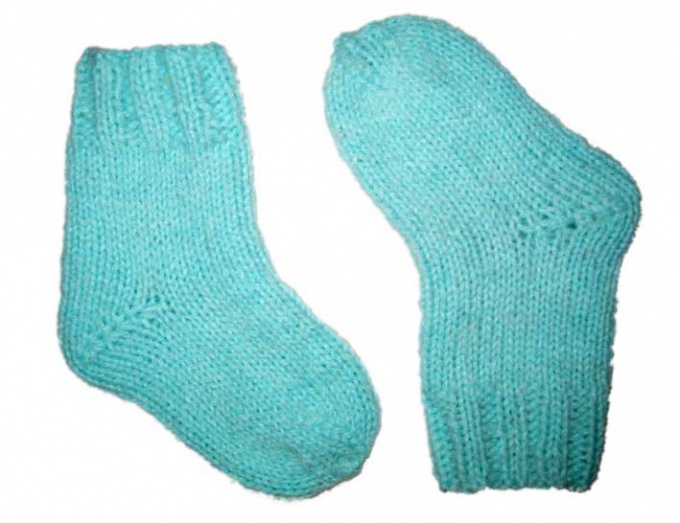 When knitting the sock, you can use jacquard patterns.